as pizza dinners in church cultural halls, and are sometimes organized by Management Society chapters. Alums talk about housing, cost of living, the pros and cons of the area, and anything else the students have on their minds. “Our alums in these companies have gone ahead of us and have made it really easy for us to get in,” Smith says. “Their support has made my job a lot easier.” Frequent Hires One way to accomplish the school’s placement objectives is to make BYU a strategic recruiting school—or core school—for as many companies as possible. As a core school, BYU would be one of a half-dozen schools a particular company turns to when hiring. But there is another purpose that goes above and beyond the business aspects of the Marriott School. Before Kim joined administrators at BYU, he was an executive at Goldman Sachs and an area seventy for the LDS Church. While living in New York City, he witnessed strong growth in church membership but a lack of leaders. He noticed that when BYU graduates took jobs out East, they not only helped strengthen the reputation of the school but also provided needed leadership and strength to the growing congregations. “I got a lot of grief when I left New York to come to Provo, but when I said my goal was to replace myself two hundred times with younger and more energetic BYU students, the tone of the conversation changed,” Kim recalls. “As I’ve talked with church leaders in other areas, they are extremely interested in this effort. 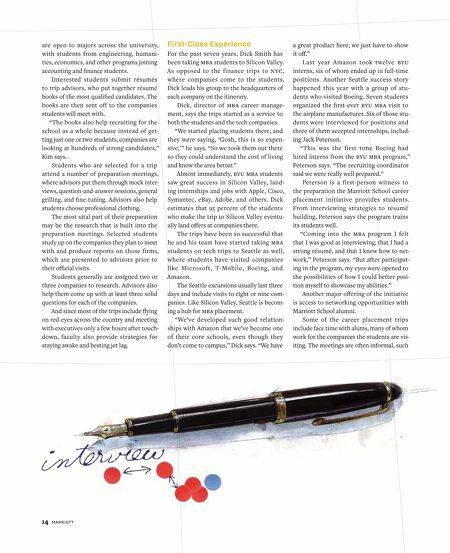 It’s helping BYU students find jobs, and it’s a great way to build the kingdom.” About the Author Todd Hollingshead graduated from BYU with a degree in communications in 2004. After working as a reporter for the Salt Lake Tribune, Todd joined BYU’s University Communications office in 2007, where he works as a media-relations manager. He and his wife, Natalie, live in Orem with their two (and a half) children. 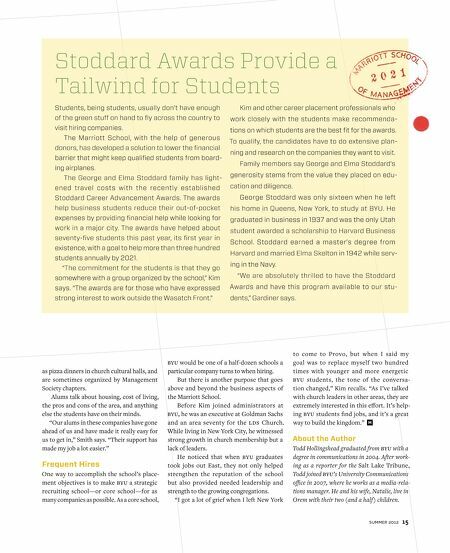 Stoddard Awards Provide a Tailwind for Students Students, being students, usually don’t have enough of the green stuff on hand to fly across the country to visit hiring companies. The Marriott School, with the help of generous donors, has developed a solution to lower the financial barrier that might keep qualified students from boarding airplanes. The George and Elma Stoddard family has lightened travel costs with the recently established Stoddard Career Advancement Awards. The awards help business students reduce their out-of-pocket expenses by providing financial help while looking for work in a major city. The awards have helped about seventy-five students this past year, its first year in existence, with a goal to help more than three hundred students annually by 2021. “The commitment for the students is that they go somewhere with a group organized by the school,” Kim says. “The awards are for those who have expressed strong interest to work outside the Wasatch Front.” Kim and other career placement professionals who work closely with the students make recommendations on which students are the best fit for the awards. To qualify, the candidates have to do extensive planning and research on the companies they want to visit. Family members say George and Elma Stoddard’s generosity stems from the value they placed on education and diligence. George Stoddard was only sixteen when he left his home in Queens, New York, to study at BYU. He graduated in business in 1937 and was the only Utah student awarded a scholarship to Harvard Business School. Stoddard earned a master’s degree from Harvard and married Elma Skelton in 1942 while serving in the Navy. “We are absolutely thrilled to have the Stoddard Awards and have this program available to our students,” Gardiner says.